Have you and your family had a photo shoot done recently and the photos are just sat on your computer or in a Facebook album? Do you often think about how special it would be to do something different with the pictures but never know what to do? At Canvasdesign we have the perfect solution for you. Family Collage Canvas Prints are a great way to display your special photo album on one complete photo montage. 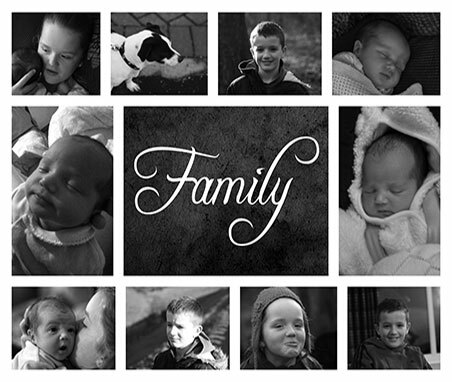 We will take your pictures, arrange them on a classy collage layout like the example we have shown. We will add a Family centre piece to show off the collage even more. Canvas prints of your family make perfect customised gifts for that person who has everything. Totally personalised and unique, you will be hard pushed to find a more unique idea to display all your family photos. Why a collage of your Family? There is nothing more special than Family. Photo shoots involving family members have become more and more popular over recent years so we thought it would be a good idea to be able to order a canvas collage of your precious shoot. This collage works just as wll with photo shoots of babies, todlers or any occasion. 10-14 photos is the ideal number for this layout.